All Sandpipers were TC Gemini SL sedans or coupes. There was also a Sandpiper II that came in TE Gemini SL sedan only. The following info relates to the original TC Gemini Sandpiper only. The official Holden option code for the Sandpiper was A9W. The Sandpiper received some other details to set it apart from the other Geminis. The Sandpiper grille and headlight surrounds were black rather than grey. Across the lip of the bonnet ran a stainless steel strip (this was later fitted to TD models). Brown pinstriping ran from the front bumper, over the front wheel arch, along the crease-line, over the rear wheel arch and trailed off under the rear bumper. A ‘Sandpiper’ sticker with Sandpiper writing and a bird (presumably a Sandpiper) was applied just fore of the rear wheel, on the rear door of the sedans and on the smooth flanks of the coupe. Sports mirrors, shrouded body-coloured pods on chrome-stalks were also fitted to the Sandpiper. These were stock items from the Holden parts-department having been fitted to both the Monaro GTS and Torana SLR ranges. 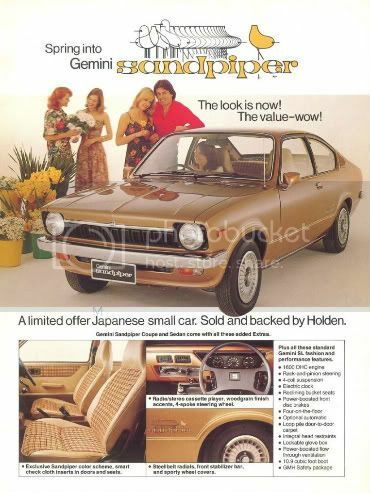 Gemini Sandpiper also received cloth inserts on the seats, fake-wood dash paneling and the four-spoke steering wheel. Also included was a radio-cassette player. All Sandpiper's received the Handling Pack option A9R which included a front swaybar and radial tyres. Finally, plastic turbine-style wheelcovers were standard. These were also fitted to other various Gemini models both before and after including the TX and TC Gemini Fashion Pack models and the later TD Gemini SL/X, not to mention the US Chevrolet Chevette.